It would seem as though I'm on a tentative schedule when it comes to blogging. So I won't say I'm back. I'll just say hello. And what better way to renew one's welcome than with something sweet? 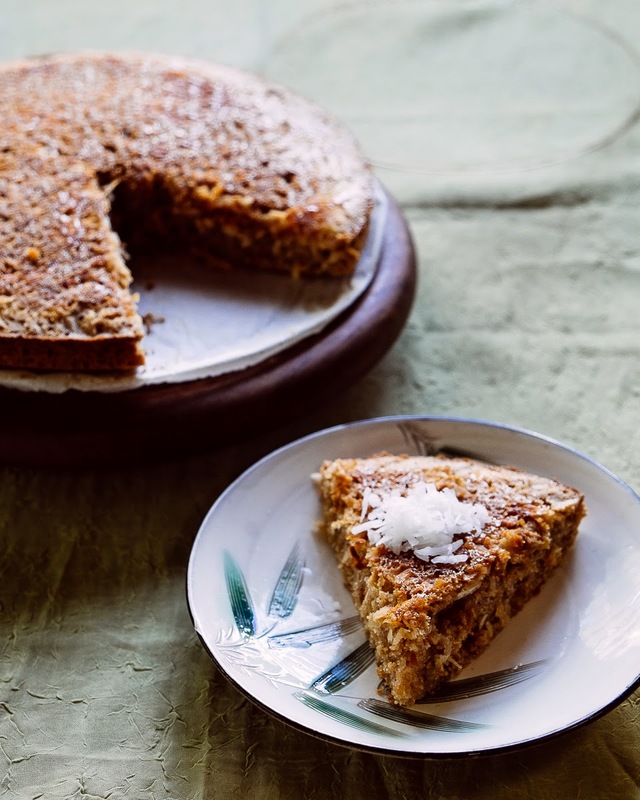 This "cake" is chewy and full of coconutty goodness. I'd liken it to a less dense mochi so it's a great substitute if you are going grain free. The flavor reminds me of butter mochi sans butter. I made it, they ate it. It was gone within an hour. I guess we all had a sweet tooth. I've posted my original recipe however if you'd like to cut down on the sugar you can substitute C&H sugar/stevia mix. In a large mixing bowl mix together all the dry ingredients. Add in the wet ingredients and mix till smooth. If you enjoyed this recipe check out my other desserts. Enjoy! loving all the coconut going on in the cake! coconut is definitely one of my favourite flavours so i think i need to recreate this recipe! Definitely one of my fav flavours!